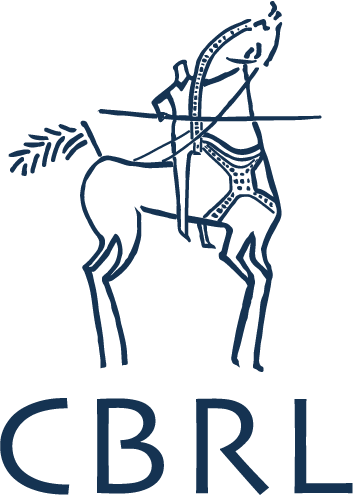 This is what is going to be the blog of the many people working with APAAME: the Aerial Photographic Archive for Archaeology in the Middle East. We hope to take you with us as we conduct our field work in Jordan this year and keep you updated on our other research during the year. There are many interesting things we do when not in a helicopter flying over archaeological sites (we promise to try and leave out the not-so-interesting bits). So, where to start? 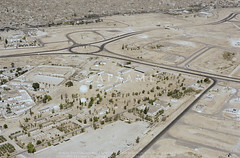 We have been looking at archaeological sites in Saudi Arabia recently using Google Earth. Our first case study conducted by David Kennedy and Mike Bishop on a high resolution area near Jeddah (published in the Journal of Archaeological Science) was picked up by the media who were amazed at the sheer number of new sites found. Well, we have moved on to another window, and we have found another site type. 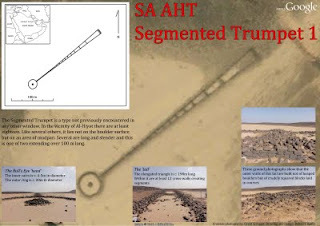 This is a Segmented Trumpet near the town of Al-Hiyat. As you can see, it is laid out quite strikingly on a mud pan and can be seen quite clearly in the Google Earth image here. This has allowed us to trace it which will allow us to compare it to other similar sites that we may find. The ground photographs show that the site was built using basalt rocks from old lava flows, or Harrats, and though most of the walls are now rubble, some systematic building of walls can still be seen in sections.